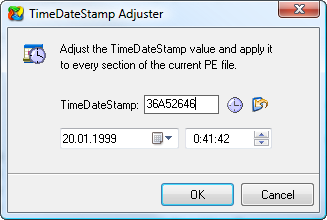 PE Explorer Adjuster tool: Change and Modify all the TimeDate Stamps to One Uniform Value. What is Time Date Stamp? It is a 32-bit value, giving the time and date the PE file was compiled. You can distinguish several versions of the same file by this value, even if the "official" version number was not altered. Apparently it is "seconds since January 1 1970 00:00:00" in UTC - the format used by most C compilers for the time_t. This timestamp is used for the binding of import directories. Some compilers tend to set this timestamp to absurd values. Selecting TimeDateStamp Adjuster from the PE Explorer Tools menu will display the Adjuster dialog. 2. It sets every field to the adjusted TimeDate Stamp. For version control purposes, you might want to modify all the TimeDate Stamps to one uniform value. This ensures that PE files compiled from the same source code do not appear different to your version control software because of differing TimeDate Stamps within the code.